What Movies Did Mafia II Remind Me Of? Or maybe I should have asked what movies did it not remind me of? 2K's Mafia games are often compared to Grand Theft Auto. The comparison is inevitable as Mafia I and II are sandbox games that feature crime, cars and dudes on missions. When I was checking out Mafia II last week at I didn't feel as though those comparisons were totally off base. But Mafia II has introduced elements like a cover system that actually makes combat, well, fun. The stage that I demoed had me moving through a warehouse, hiding behind pillars that were being chipped away by in-coming machine gun fire. From what I played, driving seemed solid, too. I did experience some camera issues while heading down a stairway and into a fistfight — but those issues might have been for dramatic effect? The hard-nosed dialogue seems to take its cue from Sergio Leone's 1984 mafia film. 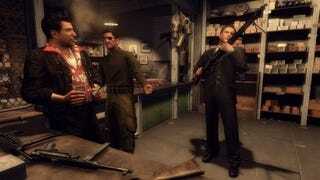 The visual look in Mafia II is reminiscent of the 1950s' scenes in Goodfellas. The end of this Mafia II trailer is a obvious hat-tip to the film. Is there a mob movie, book, video game or television show that isn't influenced by this picture? The time periods are slightly off. And the stories seem completely unrelated, but A Bronx Tale has a wonderful sense of place. If Mafia II is going to be any good, it'll need the same.